Elise Foley wrote an interesting article for The Huffington Post - Republican Senators John Cornyn of Texas and John Thune of South Dakota have announced that they plan to vote against moving on the spending bill until all earmarks have been stripped from the legislation, which is peculiar considering Republicans are mainly the ones who added the earmarks in the first place. In an attempt to stop the bill, Republicans plan on using the time to introduce new ammendments designed to strip funding from the health care reform bill passed earlier this year, as well as just run down the clock performing actions like reading the near-2000-page bill or the New START bill on the floor of the senate. The senators criticized the broader spending bill for its $8 billion in earmarks, though many of the earmarks were introduced to the bill by Republicans. 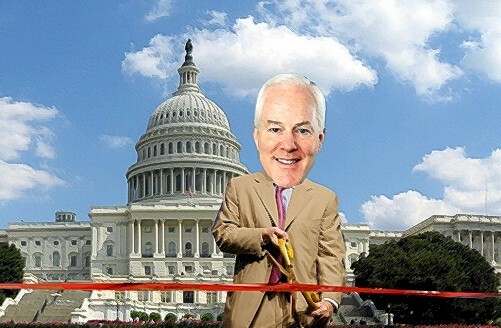 Cornyn himself proposed some $16 million in earmarks for his home state. Democrats called the statements hypocritical. Sen. Claire McCaskill (D-Mo.) said Republicans who request earmarks and vote against the bill are "half pregnant." "Republicans, as usual, are talking out both sides of their mouths," said a Democratic leadership aide. "Months ago, Senator Cornyn requested $16 million in earmarks for his state, then suddenly he woke up this morning and decided he was against the very thing he fought for. So which one is it?" Asked several times if he believed his former requests for earmarks were wrong, Cornyn said reporters were "missing the story." "This is not just about earmarks -- earmarks are a symptom of wasteful Washington spending that the American people say they want reformed," Cornyn said. "We agree with them, and that's why we will vote against this bill." So by Cornyn's own admission, Republicans are a symptom of Washington excess and that Americans want the GOP reformed. Undoubtedly, the Republicans are trying to use this moment to blame the Democrats for wasteful spending - they seem to be counting on Americans associating their opposition to this bill (they built upon) with the anti-government tea party message they encouraged for the past year, hoping a vast majority of Americans won't realize their hypocrisy, and knowing Americans, they won't notice. I also thought it was interesting that the GOP argue against deciding spending during a lame-duck session but they have no problem determining tax legislation during the same period of time, considering the Senate's passage of the Bush tax cut extensions.